It’s officially been the longest break I’ve taken from the blog, but I’M BACK! 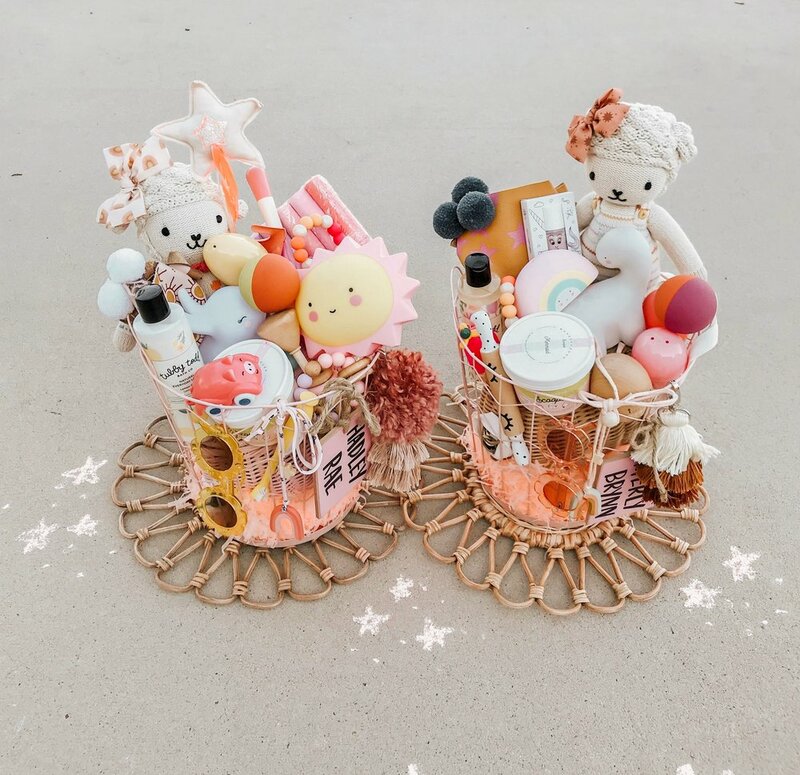 I’ve rounded up my favorite Easter Basket favorites from both big box stores (like Amazon, Target, Walmart) and from small shops that I’ve found on Instagram! You can simply tap the title of the product to be taken directly to the Instagram shop or to the store’s website to check out what they have! What I love is that many of these ideas are also GREAT for other holidays, gift options and stocking stuffers! So be sure to pin this blog post to reference it in the future if you need a gift idea for a little one! First up, BIG BOX STORE ideas! Instant Printing Camera - LOVE this as a gift for any holiday / season of the year, but it’s small enough to fit in a basket. I love it cause it’s a great time of year to gift it right before all of the summer adventures that’ll be made! It’s like a polaroid camera, just not so vintage. ha! Best water cup EVER - Let me tell you, the girls have dropped these a million times and they still look brand new, but I’m SO in love with all the colors they come in! They’re stainless steel, easy to clean and keep their water cold! Win win! Bouncy Balls - no matter how old, the girls LOVE bouncy balls. We love these the most because they aren’t super hard so if they accidentally get hurt, they don’t hurt their little faces/bodies. I get the big set and before a road trip or airplane trip we give them a new one to play with! They love them so much! Kinetic Sand - I RAVE about this stuff constantly, and any holiday we go through, I tend to get a new bag for the girls because it is OUR MOST played with activity! Amazing for fine motor skills, very limited mess and so much fun!!! Toothbrushes - It is a tradition to get the girls a new toothbrush every Easter and Christmas for baskets / stocking stuffers. Practical and a fun tradition! Chalk - But this is our favorite brand! It’s a great price, comes in the BEST fun colors, draws sooooo well and the best part is that the company has a great mission. Doodle pads - we LOVE taking these on road trips and airplanes. They’re easy to put inside a bag and the girls can use so much imagination with these! Bandaids - kinda like toothbrushes, these are another must have for Easter and Christmas for us! Burp cloths - whether you use these for what they’re meant for or simply just want them for the gorgeous pattern (me) they’re a stunning addition to a basket. We actually use them as baby doll swaddles and they work perfectly! More pajamas - these are the ones I raved about during Christmas time, and they are the softest jammies the girls own! I sized up for longer wear and they’re amazing quality and a great price! Peppero - these are the only sweets going in the girls baskets, and they love them! I am half Korean, so the girls are a 1/4 so we love these Korean treats! Water Beads - just like kinetic sand, water beads are a must have for indoor and outdoor play! But especially since we are getting into outdoor playing season, you must try these out. Great for sensory play and fine motor skill development! These are the pajamas listed in the # 2 link. Everly is 4 wearing a size 5 and Hadley is 2 wearing a size 3. I always size up for longer wear. Their faux Birkenstocks are linked here and are soooooo cute! The bows are from Indy and Pippa and the purses are from Little Moon Leather which will both be linked below in the shop small basket! These are the pajamas linked in # 13. Sooooo comfy and soft! This is a look at the leggings listed in # 11. Both girls are wearing the 3-5. Tees from Jean and June! And now for the small shop Easter Basket finds! I am A BIG BELIEVER in shopping small and supporting small business because now we are one! So be sure to check out these shops for ideas for any future gift giving needs! You’ll fall in love with the ladies behind these shops too! I love getting our baskets from Home Goods or We Are Broots! We love getting baskets that can be used year around for storage throughout the house. Tassels - Reece and Co.
And here’s some closeup shots of the shop small basket! If you wanna be able to reference anything in the future, be sure to pin one of the images above so you can come back to it! At the end of the day, we pray that we never forget the meaning of the season and how important it is to remind our littles to not get lost in the Easter Basket goodies. I think my most anticipated blog post every season are the book roundup ones, and I am totally okay with that because they are the most fun for me to do! I have always loved childrens’ books, and it is so fun to now share that passion and love with my girls! Each season (holiday) I decorate our book wall with new books to match that season or holiday. Here you can see my Summer Book Reading List roundup. Here you can see my Halloween Book Reading List roundup. Here you can see my Christmas Book Reading List roundup. And now, here begins my Valentines roundup! Our book wall. Shelves are linked here ($12.99 each) and you can see more of our book wall @amylouhawthorne. JUST A REMINDER THAT FOR ALL OF THE BOOKS BELOW, IF YOU SCROLL OVER THE TITLE OF THE BOOK NEXT TO THE NUMBER AND CLICK THE LINK WILL TAKE YOU DIRECTLY TO THE AMAZON PRIME LINK TO SHOP! YOU CAN ADD THEM TO YOUR WISH LIST THAT WAY AS WELL TO GET IN THE FUTURE! What they say : Following the death of her mother, Coco spent her early life in an orphanage, where she was taught how to use a needle and thread. From there, she became a cabaret singer, seamstress, hat maker, and, eventually, the world's most famous fashion designer. This moving book features stylish and quirky illustrations and extra facts at the back, including a biographical timeline with historical photos and a detailed profile of the designer's life. Why I think it’s perfect for Valentines : It teaches self love and self worth and that no matter where you come from, you deserve happiness and joy. What they say : I Am Enough is the picture book everyone needs, and it's now a New York Times bestseller and the picture book winner in the Goodreads Choice Awards! This is a gorgeous, lyrical ode to loving who you are, respecting others, and being kind to one another—from Empire actor and activist Grace Byers and talented newcomer artist Keturah A. Bobo. This is the perfect gift for mothers and daughters, baby showers, and graduation. Why I think it’s perfect for Valentines : It teaches this: We are all here for a purpose. We are more than enough. We just need to believe it. What they say : Adams and Oliver team up again to teach literary-minded tots the importance of friendship in A Little Princess: A BabyLit® Friendship Primer. Each page introduces Sarah’s friends with text from the original novel, A Little Princess, showing little ones that friends can be found in surprising places. Why I think it’s perfect for Valentines : A book that simply teaches the power and authenticity of true friendship and loving they neighbor. What they say : A simple and heartfelt children's book about a baby heart and where it came from. This sweet story is perfect for explaining to preschool children the emotional truth of how a new baby is made and what they mean to the parents. Also makes a charming Valentine's Day or new baby gift. Why I think it’s perfect for Valentines : The best way to explain to young kiddos how love is the spark that makes a baby and how special babies are to moms and dads. What they say : Get swept away by Little Master Shakespeare’s tale of two star-crossed lovers in Romeo & Juliet: A BabyLit® Counting Primer. Count friends, kisses, love letters, and roses in this charming retelling of Shakespeare’s famous story of young love. Since parting from such a lovely little book will certainly bring feelings of sweet sorrow, you may find yourself re-reading 'till it be 'morrow! Why I think it’s perfect for Valentines : One of the most popular stories of love of all time matched with the cutest simplest illustrations. Need I say more? What they say : Graphically appealing two-color illustrations pair perfectly with a spare, rhythmic ode to beloved trucks of all kinds - from fire trucks to dump trucks to ice cream trucks, the sweetest trucks of all - and to the kid who loves and collects them, Love Is a Truck follows Love Is a Tutu (our ballet-inspired ode to tutus and toe shoes) in our Love Is series. A smaller square format with thick, sturdy pages, make these little picture books perfect for young readers, ages 2-6, and for reading aloud again and again. Why I think it’s perfect for Valentines : The cutest book for little kiddos who love their toy trucks! Love doesn’t have to just be between people. Love is a universal language! What they say : This beautifully designed and playfully illustrated novelty board book is the perfect starting point for tiny ballerinas and parents alike. Sweet and spare rhymes prance across the pages, engaging the reader with real ballet terms and plenty of pink. Parents and toddlers together will sigh Bravo as they turn off the light. Why I think it’s perfect for Valentines : The perfect book for littles who love to dance and twirl around in pink! What they say : Every girl is unique, talented, and lovable. . . .Every girl is BEAUTIFUL. Why I think it’s perfect for Valentines : Another book to teach the power of loving yourself and knowing you are beautifully and wonderfully made! What they say : Edie is a funny, well-intentioned force of nature who leaves a trail of damage wherever she goes. Olivia meets Fancy Nancy. Edie is EVER so helpful. In fact, helping is one of the things she's best at! Some might even say she's too good. Whether it's helping her family wake up bright and early with an extremely loud song, brightening up the walls of her house with lots and lots of colorful paint, or styling grandpa's hair in the latest fashion . . . while he's fast asleep, sometimes Edie needs to be reminded not to be quite so helpful. Perfect for fans of Olivia, Fancy Nancy and Eloise -- a joyful celebration of good intentions gone wrong. Introducing Hello, World, an exciting new board book series that pairs early learning concepts with colorful, stylish illustrations of cities around the world. Paris is a treasure trove of fascinating shapes: there are triangles at the Louvre Museum, rectangles at Notre-Dame Cathedral, arches at the Arc de Triomphe, and stars in a beautiful Parisian night sky. Explore shapes all over Paris in this gorgeous board book! Why I think it’s perfect for Valentines : A book about shapes and the City of Love?! What could be more perfect for Valentines! But even better…this price is unbeatable!!!! What they say : Perfect for any fond gift or tender moment, this story of a girl and a duckling who share a touching year together will melt hearts old and young. In this tenderly funny book, girl and duckling grow in their understanding of what it is to care for each other, discovering that love is as much about letting go as it is about holding tight. Children and parents together will adore this fond exploration of growing up while learning about the joys of love offered and love returned. Why I think it’s perfect for Valentines : The sweetest book that teaches a lesson of caring for and loving those things that matter most to us. The sweetest story of friendship! What they say : In a gorgeous picture book that’s playfully sweet and visually captivating, New York Times bestselling author Melissa Marr and talented new illustrator Teagan White celebrate the many ways parents make their new babies feel at home. The world can seem like a big, bewildering place for new babies—fortunately, their mamas know just how to soothe and comfort them. Through enchanting scenes portraying all kinds of mama animals looking out for their little ones, the mother in this story reassures her baby, and young children everywhere, that their caretakers will always love them and keep them safe. 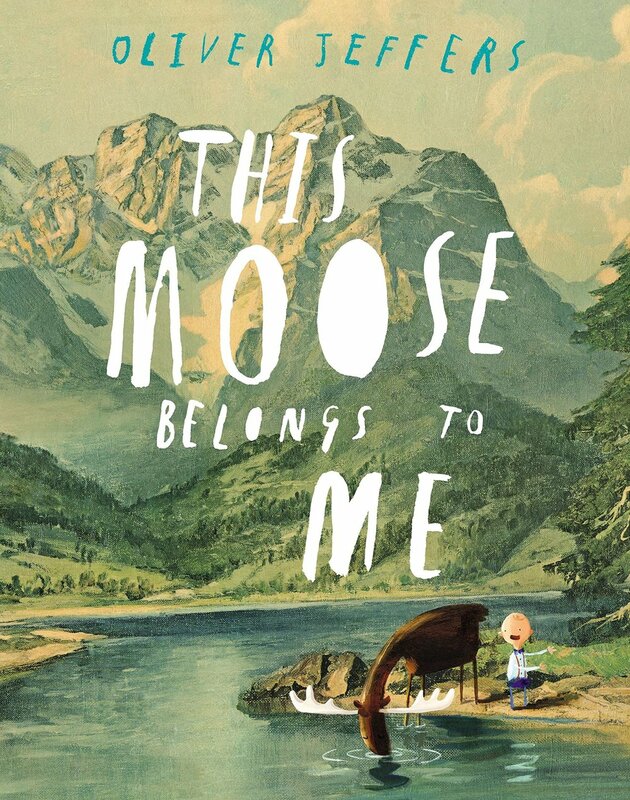 This beautiful picture book has the feel of a classic and its heartwarming premise should make it a family favorite. Why I think it’s perfect for Valentines : The sweetest book for a mama and new baby. A story of love for littles and the bond between mother and baby. What they say : Elsa dared to be different, and her story will not only dazzle, it will inspire the artist and fashionista in everyone who reads it. By the 1930s Elsa Schiaparelli had captivated the fashion world in Paris, but before that, she was a little girl in Rome who didn’t feel pretty at all. Bloom: A Story of Fashion Designer Elsa Schiaparelli is the enchanting story for young readers of how a young girl used her imagination and emerged from plain to extraordinary. As a young girl in Rome, Elsa Schiaparelli (1890–1973) felt “brutta” (ugly) and searched all around her for beauty. Seeing the colors of Rome’s flower market one day, young Elsa tried to plant seeds in her ears and nose, hoping to blossom like a flower. All she got was sick, but from that moment, she discovered her own wild imagination. In the 1920 and '30s, influenced by her friends in the surrealist art movement, Schiaparelli created a vast collection of unique fashion designs—hats shaped like shoes, a dress adorned with lobsters, gloves with fingernails, a dress with drawers and so many more. She mixed her own bold colors and invented her own signature shades, including shocking pink. Why I think it’s perfect for Valentines : A book that teaches the power of searching for beauty all around. A lesson of loving what inspires you and going after your dreams! What they say : Perfect for fans of Amélie, this is a charming story about the power of friendship, love and pink polka dots to turn rainy days into sunny ones and sadness into joy. Why I think it’s perfect for Valentines : A story of love and friendship that teaches us that we all have gloomy days and the sun doesn’t always shine, but friends can lift each others’ spirits up and the sun will always rise! What they say : Eddie is five and a half, and thinks she is the only one in her family who isn’t really good at something. So when she hears her little sister say “birthday—Mommy—fluffy—little—squishy,” it’s extra important for her to find this amazing present before anyone else does. So, gregarious, charming, clever little Eddie goes all around the neighborhood to all her fabulous friends—the florist, the chic boutique owner, the antiques dealer, and even the intimidating butcher—to find one. It’s a magical adventure that draws on Eddie’s special gifts, ones that she herself learns to appreciate. Why I think it’s perfect for Valentines : My favorite story. 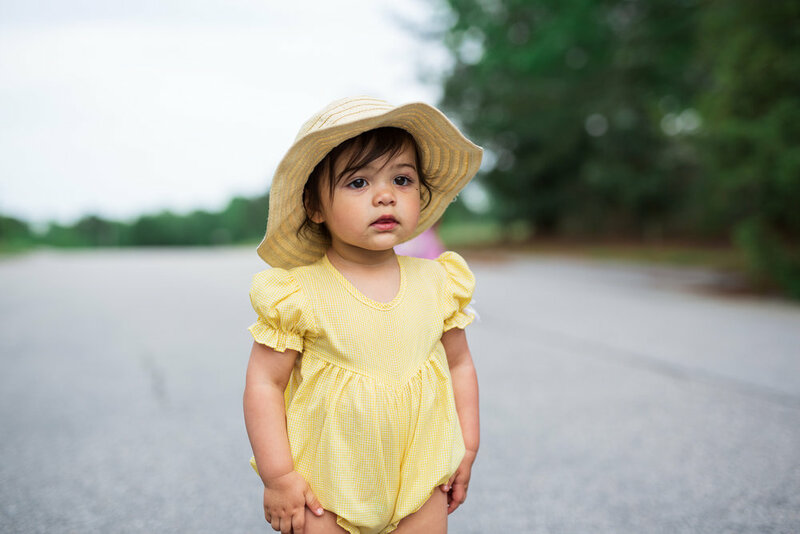 The story that shares how much our littles just wanna make us happy and make us smile. Now THAT is love. Now for pajamas! I tried really hard to find pajamas that were “valentines-y” per say, but I realized that coming off the holiday season, so many of us are just trying to save money and not spend spend spend! So, I’m doing something a little different this season and bringing you cute + comfy + CHEAP pajamas that I found on Amazon that work PERFECT for Valentines! The “girls” ones come in a soft pink, dark pink and purple color which are all perfect for Valentines! But what I love even more is they are so comfy, can easily be sized up to last a longggg time AND they’re cheap! The girls are 2 and 4 and actually both in the size Large 4-5 here. I sized up for extended wear and they work because the wrists and ankles are tight enough to keep them on but loose enough to stretch and grow with them. The “boys” options are more on the cool color side and would be perfect for other holidays, but regardless they are amazing pajamas for all year long so I had to share! I will definitely be getting these in more colors and recommend them for your littles! Here they are linked here AND ONLY $15!!! If you loved this post or want to reference it in the future, be sure to pin this picture! You can come back to it at any time to find the best love books for kids and these comfy pajamas! Thanks for reading!!! It has truly been so fun sharing our home with you and your family this season. With this being our final Christmas in this sweet little North Carolina home, I wanted to make it extra special for our family. 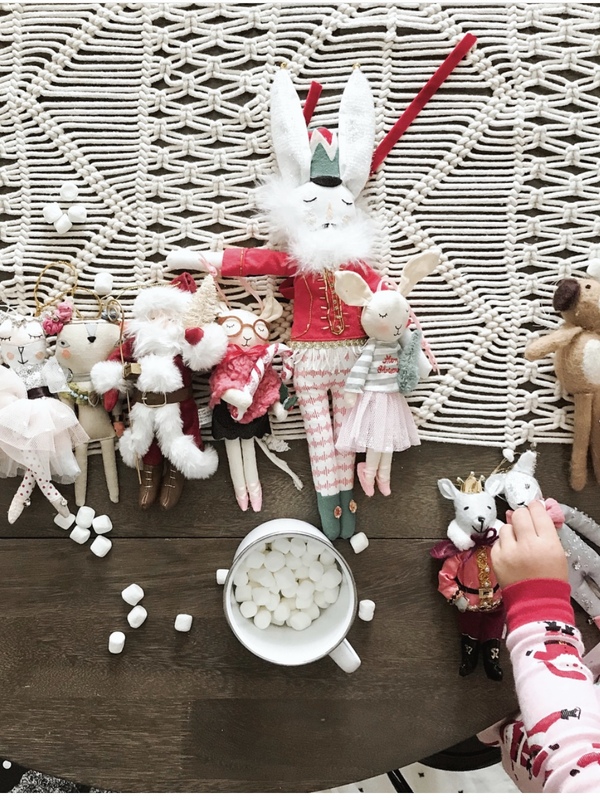 I added little touches of Christmas everywhere throughout our home and the decorations even ventured upstairs this year which was so fun to do! So here is a little peek into our home for the holidays. My biggest tip : do whatever makes your house feel like home. However much, however little, do what makes your family feel the joy and believe in the magic of this season. Thanks for checking our our home and Merry Christmas! A wonderful Holiday treat: Bagel crisps + creamy brie + Trader Joe’s sugar plum jam. Favorite holiday plates from Anthropologie last season, but these are cute too! Add a fun DIY orange garland in your kitchen for instant holiday spirit. Our holiday book collection was so fun this year! and so were the girls Christmas jammies. You can find the book selection here and the jammies here. These were such a fun DIY. We add to our collection ever year with about 10 new ornaments. This is a DIY I learned from Aubry from Hello Maypole and is so easy! Just plastic or glass ornaments, pour a little over a tablespoon of acrylic paint into the ornament and shake shake shake until the paint covers the inside. I then added pretty little ribbon adornments to them all! The sweetest magical moment from Hadley’s second birthday celebration. Twinkle lights + balloons + magic. And here’s our 4 year olds birthday dream come true. Waking up to balloons over her bed was magical! And we also add to our paper snowflakes collection each year too! Our mantel is easily a favorite. It changes often, but it’s typically a mirror or large picture surrounded by trees. You can find the sources on my IG but most stockings are found here and the mirror is here. Such a sweet moment captured on self timer of me reading my girls books. Displaying vintage ornaments may be my favorite decor of all time. Just dreamy. Love the sweet smell of cinammon + cranberries + orange slices + nutmeg + rosemary + clove in our home over the holidays. Just bring to a boil then simmer. Adding twinkle lights to the girls room was easily their favorite part of holiday decorations! The coffee wall was quite magical this season. Our neighbors came over and enjoyed some hot cocoa with us too! Fresh garland in alllll the rooms. A classic. These sweet girls just love this open area in front of our tree. This is typically where the train finds itself and it’s like my childhood all over again. This is our guest bedroom! and it’s been so sweet having guest enjoy teeny decorations in their room this season. Our formal tree is in our dining room and the girls have loved looking at these twinkling nights every single night and dancing like sugar plum fairies. Another look at our holiday book wall and the girls are wearing the best little antler ears from Indy and Pippa Co here! We’ve loved sipping hot cocoa and stringing cranberries this season too! and our #HawthorneGirlsChalkArt game is going strong. GUYS! this pic was featured on ANTHROPOLOGIE! do whattttt?!?! dream come true. we have a tradition to “feed the animals” when they come out of ornament world hibernation. The girls love doing this so much! Probably my favorite capture of the entire season. Oh that evening light peeking in through our sunroom. Just magic. The girls’ twinkle lights in their room at night are so dreamy! My office even got a little holiday spirit. But don’t pay much attention to my poor little plant! hahahah! And there ya have it. A look around our home. This is our bedroom and just adding a simple wreath and twinkle lights completely transformed this area into my dreamland. 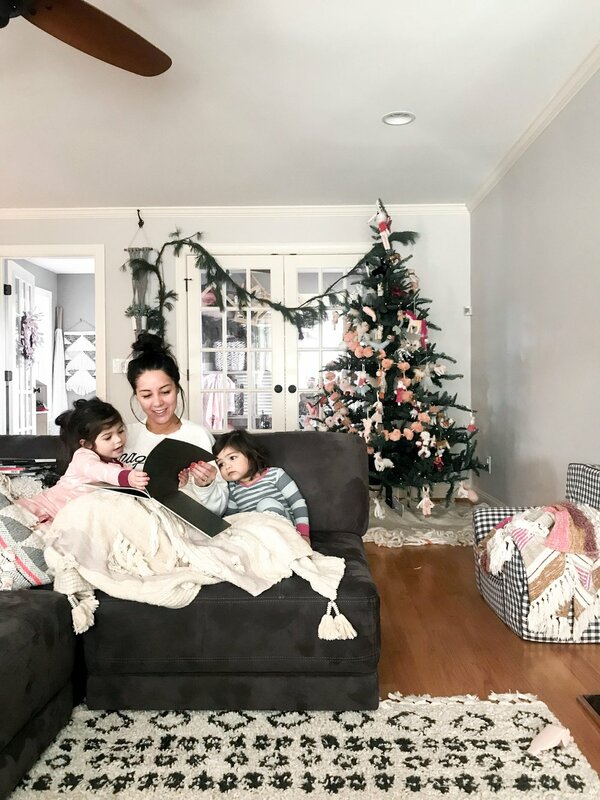 Thank you so incredibly much for taking a look into our home for the holidays! If you loved this post or wanna reference it in the future, be sure to pin an image or this image above for an easy reference in the future! Merry Christmas, Happy Holidays and thank you for being part of our community! IT’S HERE! AND JUST IN TIME FOR BLACK FRIDAY, SMALL BUSINESS SATURDAY AND CYBER MONDAY SPECIALS!!! I’ve created an ultimate shopping list gift guide for kiddos age 0-10 “ish” and most of these items have both boy and girl options available! So even if the picture looks like it’s for a boy or a girl, there is likely a boy or girl option also available! So be sure to follow each link to check out the other options. Most of these are on MAJOR sale this weekend only! You can shop easily by clicking the item title below! Also, many of these items are from small shops like ours, so we LOVE being able to support small business! Happy shopping for those littles in your life! Smithsonian Dinosaur Book - We always check this book out from our local library and I found it for a great price, so Everly will get a big surprise this Christmas. She LOVES learning about the dinos in this amazing book! Cuddle and Kind Mermaid - For every doll purchase, 20 meals are donated to children! A beautiful doll with an even more beautiful purpose! Banwood Bike - Dream bike. #AmIRight? Enough said haha. Little Belle Fairy Nightlight - Also the DREAMIEST nightlight! Can’t wait to get this in for the girls. They love fairies and this one is just pure magic. Moses Basket - Hadley LOVES baby dolls, so she’s going to love putting her babies to bed in this basket. Fawn Design Mini Bag - The mini bag is the perfect bag for little girls to twin with their mama! Oli Ella Shopping Basket - The prettiest basket that kids can use to “grocery shop” in play kitchens or to store toys in! The Daydream Republic Sunglasses - Been wanting these forever. I mean…the girls have been wanting these forever. ha! TrioKid Stroller - We have the pink Vivi of this and the girls are constantly fighting over it because it’s just THAT good. Gotta get another so they each have one hehe. And the price for the quality is UNREAL. Patagonia Jacket - A staple. The comfiest, softest, best quality jacket that lasts for so long cause it just fits that well. Also comes in so MANY COLORS! Picasso MagnaTiles - The girls have a smaller package of these and it’s just not enough. These are THE BEST TOYS we own. They are amazing for sensory processing and the best quality and what we love the most is they grow with the kids. They play with them and imagine with them for hours! Bravery Magazine - The sweetest, prettiest magazine to teach our girls to be BRAVE! Kerri Makes Plates - Can’t recommend these personalized plates enough. We have them for almost every holiday and they are truly to die for. AND SAFE IN DISHWASHER! Dinosaur Hooded Towel - Everly loves dinos and I’ve been searching for one of these forever. She can use this for YEARS! Anywhere Chair - Can be monogrammed and the cover is machine washable! Win win! Jet Kid’s Suitcase - So excited for this. The kids can ride on it in the airport AND they can be set under the seat to extend the seat on an airplane for kids to put their legs on! Brilliant! Tubby Todd Bathwash - Our all time favorite bath products. HANDS DOWN. Our girls have very sensitive skin and it’s the only products we can use that they don’t have issues with. We love all of their stuff! Fjallraven Kanken Backpack - Everly’s backpack for school and it’s truly the BEST! Pretty, amazing quality, waterproof and washes well. Smallable Canopy - The perfect addition to a bedroom or playroom to bring the magic! Would be gorgeous in a reading nook! Range Rover - Hands down the girls all time favorite Christmas gift. We have this one in white, and the review are absurd. They are all about it coming damaged in the mail, and that happens with large items. If it does, just ask for a new one! We love our little range rover! Rey To Z Hats - The cutest personalized hats for the whole family! If you loved this gift guide, or want to reference it in the future, would love for you to pin this image to a board on pinterest so you can come back to it later! Thanks for stopping by friends! And HAPPY HOLIDAY SHOPPING! So let me be really real here. I made this for myself, cause I want something easy to reference every year for Thanksgiving! And now I have it! It’s simple and perfect for the traditional Thanksgiving must haves. But I am all about sharing things that work for me with you! So that’s why I’d be remiss not to share this easy to follow guide for a traditional Thanksgiving meal. All you have to do is print this printable off, mark off all of the recipes / corresponding ingredients that you don’t need, add any additional recipes or substitutions, mark off all of the items you already have in your fridge or pantry and then get to shopping! I like doing all the dry items for grocery pickup and then I go get the frozen/fridge items and fresh items myself! If you’re really fancy, you can even print this off and laminate it for use year after year! Just leave it in a recipe book or in that kitchen “everything drawer” that everybody has and easy peasy lemon squeezy! So here ya go; here’s my ultimate Thanksgiving shopping list guide! YOU CAN PRINT IT STRAIGHT FROM THIS DOWNLOAD HERE! ***NOTE THAT THESE RECIPES ARE GENERALLY FOR A FAMILY OF FOUR TO SIX. YOU WILL NEED TO DOUBLE FOR LARGER FAMILIES OR FOR GATHERINGS. Melt the butter in a small saucepan. Add the zest and juice of the lemon and 1 teaspoon of thyme leaves to the butter mixture. Set aside. Take the giblets out of the turkey and wash the turkey inside and out. Remove any excess fat and leftover pinfeathers and pat the outside dry. Place the turkey in a large roasting pan. Liberally salt and pepper the inside of the turkey cavity. Stuff the cavity with the bunch of thyme, halved lemon, quartered onion, and the garlic. Brush the outside of the turkey with the butter mixture and sprinkle with salt and pepper. Tie the legs together with string and tuck the wing tips under the body of the turkey. Roast the turkey about 2 1/2 hours, or until the juices run clear when you cut between the leg and the thigh. Remove the turkey to a cutting board and cover with aluminum foil; let rest for 20 minutes. Preheat the oven to 325 degrees F (160 degrees C). Place ham in a roasting pan. Score the rind of the ham with a diamond pattern. Press a clove into the center of each diamond. Drain the juice from the pineapple rings into a medium bowl, and stir in the brown sugar. Coat the ham with this mixture. Arrange the pineapple rings over the outside of the ham. Place a maraschino cherry in the center of each pineapple ring, and secure with a toothpick. Bake uncovered for 4 to 5 hours, basting frequently with the juices, until the internal temperature of the ham is 160 degrees F (72 degrees C). Be sure the meat thermometer is not touching the bone. Remove toothpicks before serving. Melt butter in a large skillet over medium-high heat; saute onion in hot butter until onion is soft, 5 to 10 minutes. Put bread cubes in a large bowl. Season bread with salt, sage, thyme, poultry seasoning, and black pepper. Add onion mixture to bread cubes; stir. Pour bread mixture into a large casserole dish and cover the dish with aluminum foil. Bake in the preheated oven until golden and hot, about 1 hour. Bring a large pot of water to a rolling boil, season with 2 tablespoons salt, and blanch the green beans for 5 minutes. Shock the green beans in a bowl filled with ice water, then remove and set aside to dry. Melt the butter in a large cast-iron pan or Dutch oven over medium-high heat. Add the shallots and cook until lightly browned. Add the mushrooms and some salt and pepper, and cook until just softened. Add the flour and stir to coat the mushrooms. Add the chicken stock, whisking vigorously to smooth out any lumps. Whisk in the half-and-half. Bring to a simmer and cook for 3 minutes. Check the seasoning and adjust with more salt and pepper as needed. Add the green beans, then pour the mixture into a 9-by-13-inch baking dish. Bake for 30 minutes. Let the casserole rest for 5 minutes. Sprinkle with fried onions to lend some extra crunch. Serve. Going easy here. I love the Target Krusteaz Gluten Free Honey Cornbread. Not doing homemade this year. And we typically do Pillsbury Grands Rolls or fresh bakery rolls. In a medium saucepan over medium heat, dissolve the sugar in the orange juice. Stir in the cranberries, and cook until they start to pop (about 10 minutes). Remove from heat, and transfer to a bowl. Cranberry sauce will thicken as it cools. Bring a pot of water to a boil; add a generous sprinkling of salt the pasta. While the pasta cooks, melt the butter in a skillet or pot large enough to hold the pasta when it's done. Add the flour and stir over medium heat until the mixture is lightly browned; 1-2 minutes. Add the milk and whisk to remove any lumps and add the salt and pepper. Cook over medium-high heat until the sauce thickens and starts to bubble. About 6 minutes. Stir in the cheese and whisk until smooth and melted. Turn off the heat. When the pasta is almost done but still firm, drain it and add to the sauce. Stir the pasta into the sauce and bake in a greased 2 quart dish (or an 8x8 pan works pretty well) 20-25 minutes until browned and bubbly. You can also skip baking it if you want it super creamy and just put it under the broiler to brown the top (keep an eye on it) and then serve. I hope this helps you for your Thanksgiving shopping this season, and for many seasons to come! If this was helpful, be sure you pin one of these images to your pinterest board for future reference! And make sure you let me know in the comments if there’s another recipe you love that I didn’t include on the printable! I always love trying new recipes! Hugs and happy baking! oh and HAPPY THANKSGIVING! WE ARE SO GRATEFUL FOR YOU!!! Another much anticipated blog post is here! Our Halloween book post was SO popular, so we’re bringing the same format to you this Christmas season! Below you’ll find all of our favorite holiday inspired books! You can read more about why we love children's books soooo much here, (which also takes you to our favorite summer book's reading lists), but let's just get right to it. I love to display the current season or holiday books on these Ikea shelves here in our girls' shared bedroom! (we have 3 x 45 1/4 shelves). They're so good right?!? They're the PERFECT display shelves and you can't beat the price! With this colorfully illustrated board book version of the classic Christmas-time ballet, Jennifer Adams and Alison Oliver present a new holiday favorite, The Nutcracker: A BabyLit® Dancing Primer. This board book features soldiers marching, mice prancing, snowflakes swirling, dolls bending, and buffoons skipping as a way to introduce basic movement terms to babies and toddlers. Olive is merrily preparing for Christmas when suddenly she realizes "Olive... the other Reindeer... I thought I was a dog. Hmmm, I must be a Reindeer!" So she quickly hops aboard the polar express and heads to the North Pole. And while Santa and the other reindeer are a bit surprised that a dog wants to join the their team, in the end Olive and her unusual reindeer skills are just what Santa and his veteran reindeer team need. Long ago, a brave little girl named Anja wanted to be one of Santa's elves. So she leaves a note for her family and helps her elderly neighbor prepare for the holiday, then she straps on her skis, and heads out into the snowy landscape. From a red bird to a polar bear to a reindeer, a menagerie of winter animals help Anja make her way to Santa. A generous trim-size, matte cover, extraordinary photographs, and foiled title make this a special book for the holiday season. The story of a father and his son who live by themselves in a cosy cabin in the woods. But, one day they are separated out in the beautifully falling snow. The boy is lost and falls asleep. When he wakes up he is surrounded by blinking eyes, a rabbit, a fox, an owl and all manner of other creatures have surrounded him! But with a bear hug he and the woodland animals become best of friends! But soon he misses his dad and so the animals bring him back home. The father opens up his heart and home, and lets nature and love envelop their previously lonely existence. Snowflakes? Many snowflakes. Winter is coming. So begins this ever-so-simple story. As the snow starts to fall, the excited penguins pull out scarves, mittens, heavy socks, and boots, and Mama helps them bundle up. But when it’s time to go out, one timid penguin decides to stay home. Filled with waddling baby penguins, playful text, and delightful illustrations, this book feels like a young picture-book classic in the making. Part of the magic of the Christmas season stems from the traditions that families and friends take part in every year: hanging up stockings; putting lights in the windows; and, one of the most important of all, picking out and taking home the Christmas tree. An enchanting Christmas story about a magical yet unlikely friendship between a little girl and a lost reindeer sure to be a Christmas classic lovingly told and illustrated with red foil highlights and interactive die cuts. When a jingling sound wakes her from her sleep, a little girl’s dreams come true when she meets a lost reindeer in the forest. They set off on a magical adventure and it becomes a Christmas never to forget. Nicola Killen’s evocative illustrations are sure to enchant in this beautiful book with die cut pages, foil, and flashes of festive red. This mouse doesn’t want to stay in the house . . . even if it’s cold outside! For most field mice, winter means burrowing down and snuggling in. But not for Lucy! She loves snow crunching under her paws and wearing a fluffy wool hat. And most of all, Lucy loves to skate, and she’s just ACHING to show off her new skill with her friends. After all, a winter wonderland is twice as nice when you have friends to enjoy it with. But the other mice just don’t understand—and after a disastrous indoor snowball fight, it looks as if they never will. Can Lucy find a way to make the other mice come out and “mice skate” too? When snowflakes fall, two sisters react very differently. One is excited and the other is wary. The first sister spends the morning outdoors, playing until she's all tuckered out. Meanwhile, the second sister stays indoors, becoming ever more curious about the drifts outside. Soon, they switch places, and spend the second half of the day retracing each other's footsteps. But each sister puts her own unique spin on activities like sledding, baking and building. Charles wants to find a wish tree. His brother and sister don't believe there is such a thing, but his trusty companion Boggan is ready to join Charles on a journey to find out. And along the way, they discover that wishes can come true in the most unexpected ways. Alec loves to climb trees—the little apple trees, the wide willow trees, even the tall locust trees. But his favorite is the great spruce, with its sturdy trunk and branches that stretch up to the sky. Alec’s grandpa planted it as a sapling years and years before Alec was born, and every Christmas, Alec and his grandpa decorate the tree together, weaving tinsel and lights through its branches, making it shine bright. But one day, a few curious men from the nearby city take notice of Alec’s glistening great spruce, and ask to take it away for their Christmas celebration. Though it’s a huge honor, Alec’s heartbroken at the idea of losing his friend. With great courage and creativity, Alec comes up with a plan to save his favorite tree in this joyful holiday tale. In this beautiful book from debut creator Bomi Park, a young girl wakes up to the year's first snowy day. From her initial glimpse out the window to her poignant adventures—rolling a snowman, making snow angels—the girl's quiet quests are ones all young readers will recognize. Simple, muted text and exquisite, evocative art conjure the excitement of a day spent exploring the wonder of snow—and the magic that, sometimes literally, such a day brings. 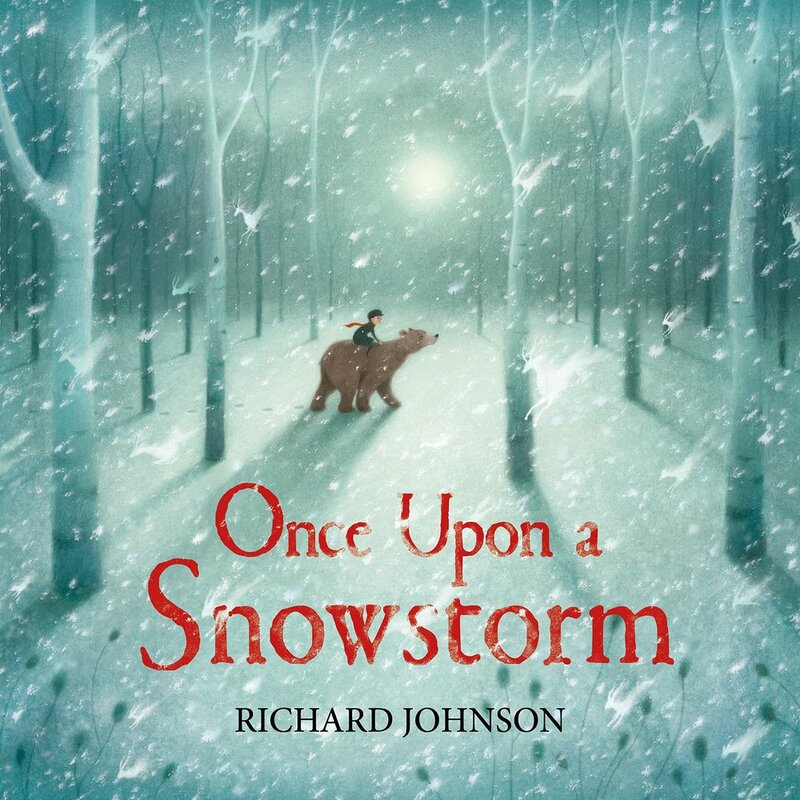 As subtly joyful as a snow day itself, this book will find its home in the hearts of young adventurers everywhere. Christmas is coming, and Olivia is incredibly busy. She has to wait for Santa, make sure Dad sets up the tree, watch Mom make the Christmas dinner, oversee the care with which the stockings are hung, and, of course, OPEN HER PRESENTS! Whew, being helpful during the holidays is exhausting! If you loved this post and want to reference it in the future, be sure you pin the images above so you can easily reference it in the future! These would make for great Christmas presents and are just too pretty to pass! Happy reading friends! The most requested blog post for the holidays is here! Our “Halloween jammies” blog post was so popular (which by the way-lots of those are on sale if you wanna snag some a size up for next year! ), and y’all are begging for Holiday jammies! So here it is! 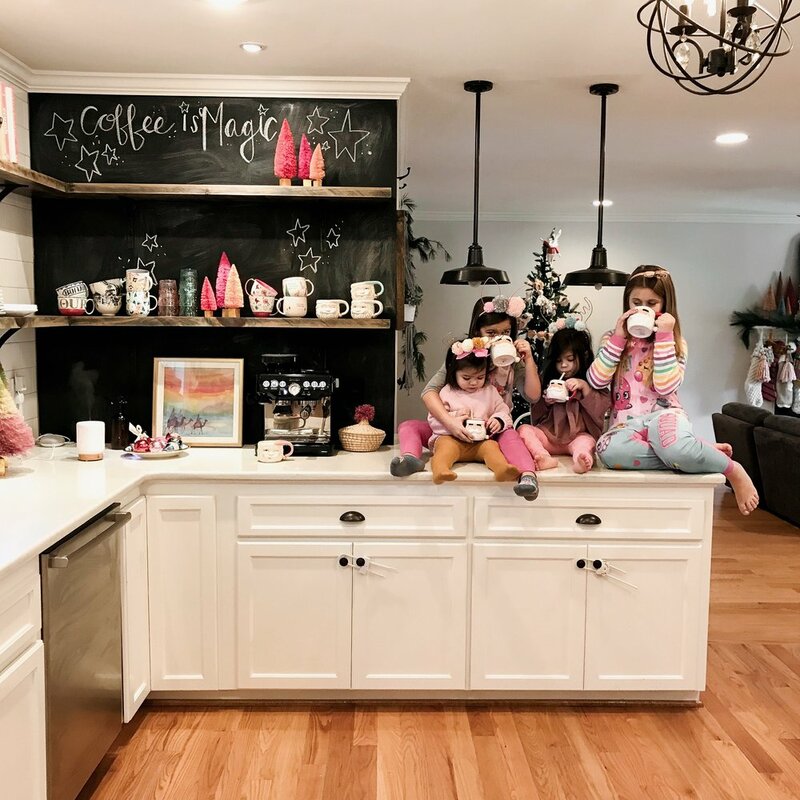 The best holiday jammies I’ve found for kiddos (both boys and girls) plus some extras for mamas and papas that are just so so good!!! AND BONUS! Here are some favorites for the adults! Many of these have matching kiddo versions, so you can dress the whole family! Just follow the link and search for the matching sets! My number one favorite Holiday jammies EVER!!!! They’re pricey but the quality is amazing, you get 2 in the pack, they can be worn year around AND THEY’RE GIRLY DINOSAURS which aren’t always the easiest to find! YES YES YES!!! Here’s a few more I found later in the season that are also must haves! AND ON SALE! The red and grey thermals are here, and the pink snowmen ones are here! And some more for the adults! Also on sale! 1, red striped jumpsuit is here, 2. THE most comfy pajama pants are on sale here! and 3. The cutest charcoal year round grey jumpsuit here! OH and here’s some awesome mens’ styles HERE and HERE! If you loved our jammies’ roundup, be sure to pin this image below so you can easily reference it and so others can see it too! We are so grateful for your support! I’ve been so excited to share with you my favorite Christmas list items this year! Most of these items are very reasonably priced, but there is maybe (okay yes) one big splurge on there if you’re a coffee drinker. And honestly, this is more of a family present if you’re wanting to make an investment to have Starbucks-like drinks in your home! I hope you love these as much as me, and if there’s anything else you love and have on your list, share in the comments below! I’d love to see what you’re asking Santa for this year! ***EACH OF THESE ARE EASILY ACCESSIBLE AND CAN BE ADDED TO YOUR CHRISTMAS SHOPPING LIST JUST BY CLICKING THE LINK WITHIN THE TITLE OF EACH ITEM! What I love: I have heard from SOOOOO many people that this pillow is amazing, and I’m also a big believer in Amazon reviews. Those people don’t lie haha! I also oddly enough have very bad allergies to many pillows, and with this one being hypoallergenic it’s a for sure Christmas list item for me! What they say: Made in USA. Fully ADJUSTABLE PILLOW with our PROPRIETARY MIX of SHREDDED VISCO ELASTIC MEMORY FOAM - ADD or REMOVE foam to adjust to your comfort, perfect custom made pillow each time - for all sleep positions. Allows greater ventilation - Promotes proper alignment allowing deeper sleep through the night. *PATENT PENDING. REST ASSURED - CertiPUR-US Certified foam. Our pillows are made without ozone depleters, PBDEs, TDCPP, TCEP flame retardants, mercury, lead and heavy metals, formaldehyde, phthalates regulated by the CPSC, or CFCs. Our foam has been analyzed by independent, accredited testing laboratories. WHAT IS IN YOUR PILLOW? Our pillows meet the CertiPUR-US standards for content, emissions and durability, and are analyzed by independent, accredited testing labs. HYPOALLERGENIC & DUST MITE RESISTANT - allergy sufferers no longer need to compromise comfort! EASY TO CARE FOR - MACHINE WASHABLE - 5 Year Warranty - Guaranteed it will not go flat. What I love: I’ve been in need of a new straightener since I’ve had the same one for about 10 years (since early college). I’ve heard great things about this one, so this is a must have on my Christmas list! MY NUMBER ONE REASON FOR WANTING IT THOUGH? -there’s an auto off after 90 minutes of non use. And to me, that’s worth it. I can’t tell you how many times I’ve accidentally left my straightener on, and this feature is golden! What they say: LCD digital display. Safety auto off after 90 minutes of non use. Heat up to 380℉ at constant temperature in 15 seconds, takes less time to design a hair style and helps prevent damage. What I love: We have this (both Blake and I have one) and for the mama who re-warms their coffee 8,000 times this is for you! It actually keeps my coffee warm longer and I don’t have to rewarm it! Plus they’re actually not bad looking which I love too! It also comes in a MILLION color options! What I love: Got this tote as an early Christmas/ Birthday present and can’t recommend it enough. If you’re needing a real leather tote that goes with ABSOLUTELY everything AND fits your laptop case, AND will hold up for ALL the years. this is it. Plus, there’s just nothing quite as amazing as the smell of fresh leather! The quality is perfection!!! Love that they’re made right here in the USA too. What I love: We also got these as an early Christmas gift for the girls and I and ohhhh my word, I can’t tell you how many compliments we received wearing them! They’re all made with the best quality and the blush pink color is legit perfection. The girls actually LOVE wearing theirs and I love that they will grow with them because the backs are adjustable! So it’s an investment hat for over the years! Plus the modern initial is just the sweetest!!! What I love: I’ve had these for 2 years now. They were my babymoon gift to myself before I had Hadley and they are my go - to slippers every day. I love that they have hard soles (which makes them totalllyyyyy appropriate for wearing outside the house haha!) The super soft interior is hands down the coziest ever anddddd I love that they come in a ton of color options! In my opinion, you can’t ever go wrong with Uggs! p.s. I also have these Minnetonka ones, and they too are highly recommended as I’ve had these for about 8 years and they’re still in perfect condition! What they say: A water-resistant suede slipper is trimmed with shearling and lined with UGGpure, a textile made entirely from wool but shaped to feel and wear like shearling. What I love: I just signed up for another marathon next spring, so these are the gift I’m asking for to make my marathon training so much better! I am so tired of that stinkin’ cord for my headphones, and these will make all my tangle nightmares disappear! I also love that the reviews for these are amazing, which can always be hit or miss with electronic devices! What I love: I have been wanting this for a few years now and this year I’m really asking for it, because I really want to get better at documenting pictures (and not having them pile up on my phone or computer!) This gives me an easy quick way to print at home, but I ALSO love it because it’s such a perfect printer for putting pictures in my Bible for journaling! I want to start praying for specific people, and this is the perfect answer for that! What I love: I’ve been eyeing these for years, and I finally got one during a Labor Day sale this year! AND I bet they’ll be on sale so much during the holidays! So this is your time to get one or add it to your list if you’ve been eyeing them too! They’re super trendy, come in multiple colors AND of course the comfiest pullover ever!!! For reference, I am around 127 lbs and 5’4” and I got a size small and love that it’s more on the fitted side as seen in the pic below! What I love: I am a sucker for cute coffee table books, and this one is just perfection! I obviously love pink, and this one is just the perfect touch to add to our cookbook collection! What they say: Home Baked is a beautiful collection of van Boven’s favorite baked goods—warm bread from the oven, sweet banana bread, a gooey cinnamon and caramel pull-apart loaf, rich chocolate cake, shortbread cookies, and more. And alongside these beautiful images of delicious treats, van Boven provides step- by-step instructions for how to make them in your own home. And she leaves no one out—working with different types of flours (including gluten-free) so there is something for everyone to bake. What I love: Blake bought this for me during Prime Day earlier this year, and can I just say I never knew a blow dryer could change your life! hahahah! It’s amazing how much time I save now by actually using a blow dryer that works well! I’m not kidding, this blow dryer is heaven sent and it works so quickly on the girls’ hair too! With a house full of girls with lots of hair (and a hubby with zero hair who just DOESN’T get it ;) It’s important for us to have a good blow dryer! Rey to Z hats, Portland Leather Goods tote, and Abercombie pullover seen here. 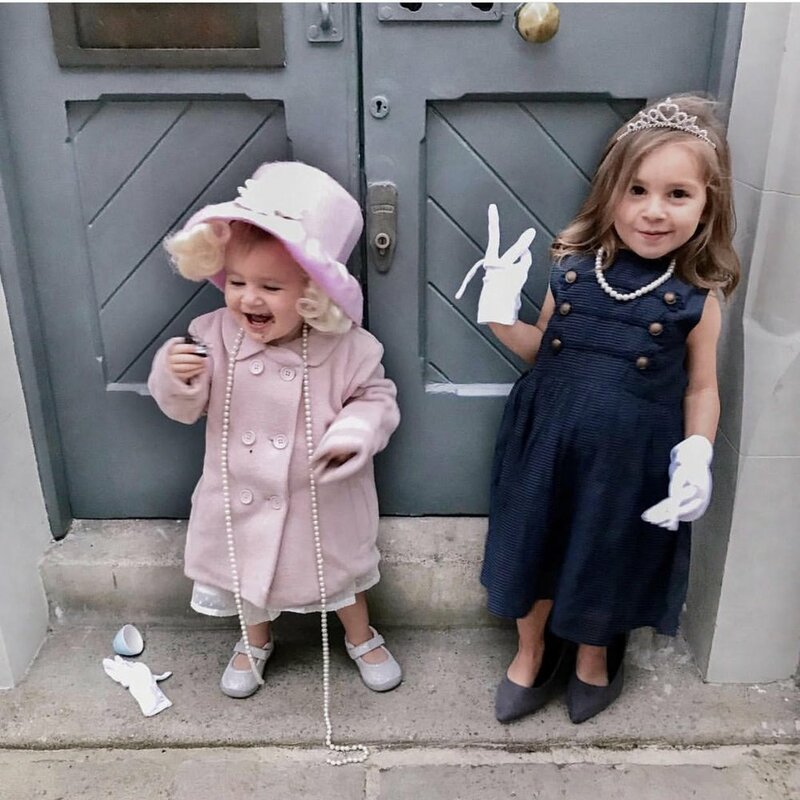 I hope you find something that catches your eye, and I also hope you are able to pay a visit to so many of these wonderful families who have put together the cutest, most clever, silliest and pretties costumes EVER! We are honored to be able to feature them here, and be sure to pin this image below to your pinterest board for easy reference for years to come! 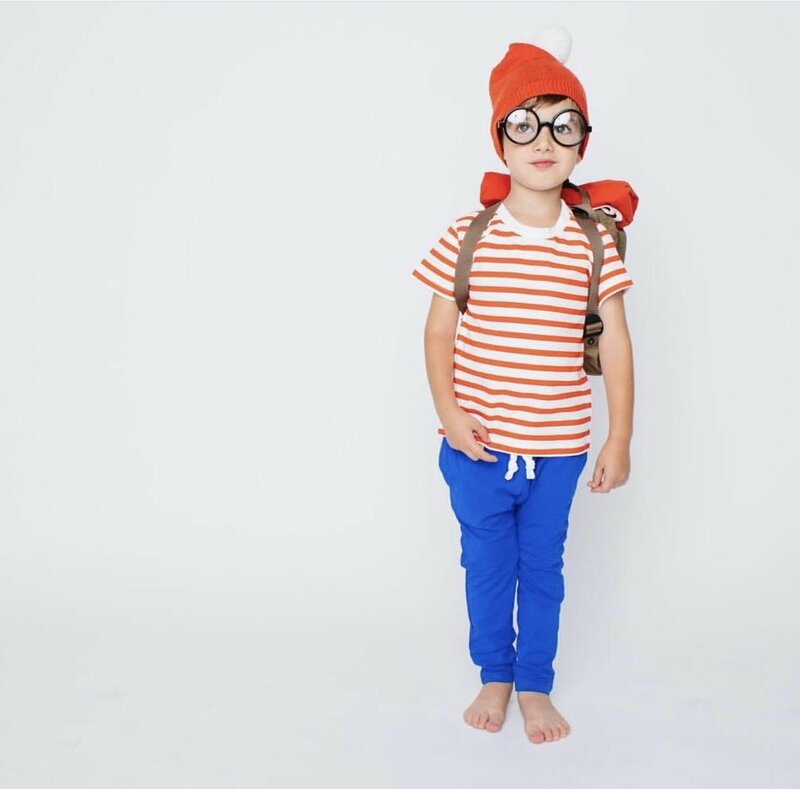 Below you will find a collection of curated halloween costume images, collected from Instagram. Each owner of the image is tagged below their picture, and you can visit their profile for more details on the costume! 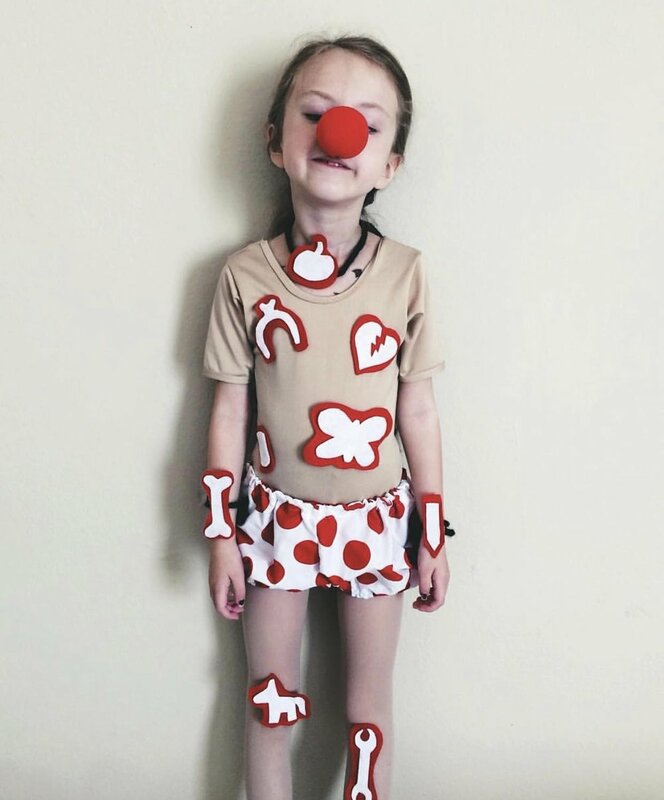 I chose to feature costumes that were mostly DIYs, as we want these to be fun to make and create, and we always love that with DIYs you can add your own personal touch! 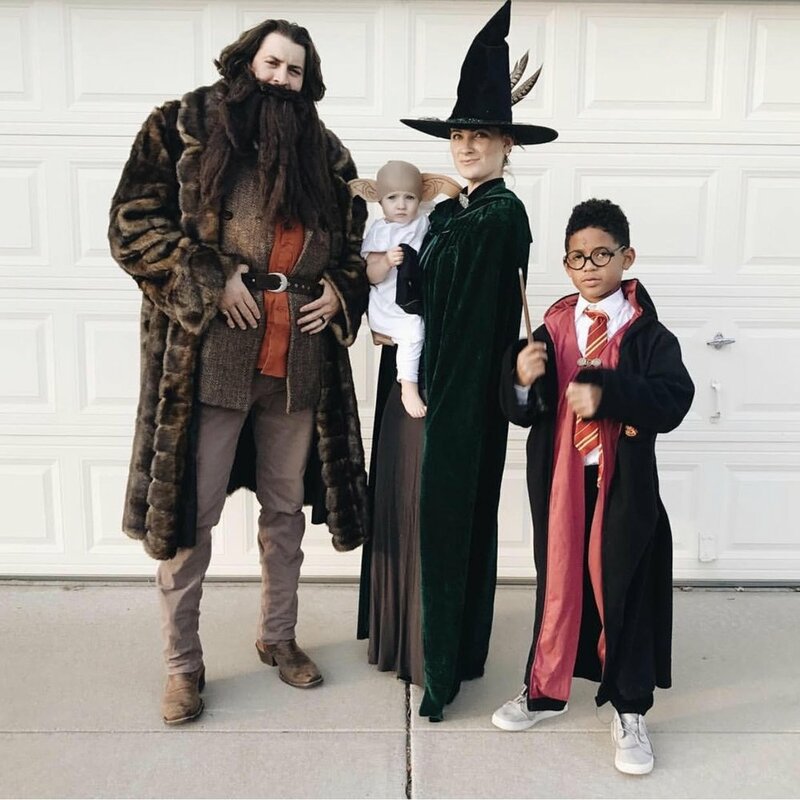 I’ll start with our own family costumes from the last few years. You can find all of these on my personal page @amylouhawthorne. They were so fun to make! Be sure to pin this image to pinterest for years to come so you have an easy reference for future Halloween costumes! I hope you loved seeing these as much as I loved curating them! Now, let’s get to creating! I have been SO pumped to write this post! #1, cause I’m a foodie. I love love love yummy food. #2, cause I’m so excited to share so many recipes that others have mastered so that you can enjoy them with your family too! Disclaimer, we generally eat very healthy in our home - but I also believe in indulging every now and then. I think it’s good for your metabolism to mix things up, but more importantly … I think it’s good for your soul. So many yummy recipes can be altered to meet your diet restrictions and needs, so have fun with the holidays! Make something that’s festive! And if you’re typically picky or very restricted, have fun with baking something and giving it to someone else. I know someone will enjoy it! p.s. I’m also excited to share our guest blogger today! Kelsey of Klos + Co will be joining us at the end of this entry with 3 AMAZING recipes for you to try with your family!!! Be sure to go give her some love over at her IG here! Thanks so much for pouring your heart (and hands) into those three recipes you shared, Kelsey! This yummy and EXTRA moist pumpkin bread is from my personal instagram account and was so so easy to make!!! It tasted like starbucks pumpkin loaf! We used it to BOO our neighbors! Preheat the oven to 325°F and set an oven rack in the middle position. Generously grease two 8 x 4-inch loaf pans with butter and dust with flour (alternatively, use a baking spray with flour in it, such as Pam with Flour or Baker's Joy). In a medium bowl, combine the flour, salt, baking soda, baking powder, cinnamon, and nutmeg. Whisk until well combined; set aside. In a large bowl of an electric mixer, beat the butter and sugar on medium speed until just blended. Continue beating until very light and fluffy, a few minutes. Beat in the pumpkin. The mixture might look grainy and curdled at this point -- that's okay. Add the flour and mix on low speed until combined. Turn the batter into the prepared pans, dividing evenly, and bake for 65 – 75 minutes, or until a cake tester inserted into the center comes out clean. Let the loaves cool in the pans for about 10 minutes, then turn out onto a wire rack to cool completely. Fresh out of the oven,the loaves have a deliciously crisp crust. If they last beyond a day, you can toast individual slices to get the same fresh-baked effect. How adorable is this pretzel mix by Amanda Cruse?! And so simple! This batch, we used: pretzel sticks, @theskinnypop popcorn, @chexcereal rice cereal, festive sprinkles & drizzled w. @ghirardelli white almond bark. Mix in a large bowl, spoon out onto parchment paper or cookie sheet, let harden for fifteen min & then break up into pieces. Store in a glass canister & snack forever! Cutest and simplest pumpkin crispy treats from the best blog The Mama Notes!!! We love Caitlin! Over low heat stir marshmallows and butter until completely melted. Immediately stir in cereal and remove from heat. Press into a greased glass baking dish, let cool and then cut into squares. Another yummy recipe from my personal page, and this one is extra special cause we make it every year on my daddy’s Heaven welcoming anniversary. Chicken pot pie was his favorite. Make the crust: In a food processor, pulse together flour, sugar, and salt. Add butter and pulse until mixture resembles coarse meal, with a few pea-size pieces of butter remaining. Sprinkle with 3 tablespoons ice water. Pulse until dough is crumbly but holds together when squeezed (if necessary, add up to 2 tablespoons ice water); do not overmix. Form dough into a disk, wrap tightly in plastic, and refrigerate until firm, 1 hour or overnight (or freeze, up to 1 month). Preheat oven to 375 degrees. Make the filling: In a large pot, melt butter over medium-high. Add onion and carrots and cook until softened, 8 minutes. Add garlic and cook until fragrant, 30 seconds. Add flour and stir to coat vegetables. Slowly add broth, whisking constantly until sauce is smooth. Bring to a boil, reduce heat, and simmer until thickened, 5 to 7 minutes. Stir in peas. Season with salt and pepper, then stir in chicken and parsley. Pour filling into a 2-quart baking dish. On a floured work surface, roll out dough to 1/8-inch thickness. Place dough over dish and fold overhang inward while pinching to crimp edge. Cut vents in dough. Place dish on a rimmed baking sheet and bake until crust is golden brown and filling is bubbling around edge, 45 to 50 minutes. Let cool 15 minutes before serving. Roll your dough a couple inches larger than your dish: Folding it up and over, pinching as you go, forms a beautiful decorative edge. To make potpies ahead of time, let the filling cool, then assemble and freeze for up to 4 months. Bake at 425 degrees, 1 1/4 hours (1 hour for small pies). MUMMY BARK! How cute is this from Creme de la Crumb?! 1. Chop cookies into quarters and set aside. (Be sure to keep the bits and crumbs that fall aside when you're chopping the cookies). 2. Place chocolate chips in a microwave safe bowl. Microwave on half power for 2 minutes. 3. Stir, return to microwave for 20 seconds at a time stirring after each until smooth. 4. Transfer 1/4 cup of the chocolate to a resealable plastic bag and set aside. 5. Set aside the large cookie pieces and add the rest of the bits and crumbs to the white chocolate and stir to combine. 6. Pour chocolate onto a foil-lined baking sheet. Use the back of a spoon to spread chocolate to 1/8 inch thickness. Press reserved cookie pieces into the chocolate. 7. Put the baking sheet in the fridge or freezer for 2-5 minutes until chocolate cools completely. 8. Snip the corner of the plastic bag and drizzle reserved chocolate over the cooled chocolate and cookies. 9. Press candy eyes into drizzled chocolate in pairs to create mummy eyes. 10. Return to fridge or freezer until completely cooled. Use a butter knife to cut into chocolate to break into pieces and serve or store in airtight container at room temperature up to 1 week. Jessica Garvin never disappointing, especially with these pumpkin pie milkshakes! Oh yes! Combine first 5 ingredients in a blender; process until smooth. Pour 3/4 cup ice cream mixture into each of 4 glasses. Top each with about 2 teaspoons whipped topping; sprinkle with the additional pumpkin-pie spice, if desired. The prettiest and tastiest pumpkin pie from one of our all time favorite bloggers Heidi, and if you don’t already follow her - you MUST!!! One of our favorite pictures of another one of her gorgeous pies, from one of our favorite people. We love you Casey! 7). Allow the pie to cool before serving. Nothing overly complicated here, just the SWEETEST little BOO pancakes by the incredibly inspiring Raven Vasquez! Get you some letter cutters from Amazon, like these, and cut out homemade or Bisquick pancakes! And the best part is, you can do this for every holiday! We also love using the cutters for cookies too! This is from my personal account and it’s my all time favorite fall recipe! Butternut squash soup!! It’s the perfect soup for cool days and it’s always such a hit! You can make it sweet or spicy too! Just by adding different flavors! This recipe is super tailorable which I love! Chop the carrots, celery and onions in big chunks and add to the pan. Peel the garlic and add cloves whole. Roast for 1 hour (or up to 1 hour and 15 minutes, if the veggies are not yet soft). Dip ½ of each pretzel rod in the melted CANDIQUIK; allow excess coating to drip off and place on wax paper. Before coating has set, place two mini chocolate chips on as the eyes. For the mouth, cut off the tip of a mini chocolate chip and place on the pretzel with the bottom side facing up. These ADORABLE ghost cookies are from my girl Haley of Indy and Pippa. Co! Are they not the cutest?!?!?! She actually got this cutter from the Target Halloween section, but I’ll share my all time favorite rolled sugar cookie recipe here that is sooooo easy to frost and make cute like these! Here's my all time favorite cream cheese frosting! Fall is here, or at least that is what I hear/ see every day on instagram. Fall is definitely my favorite season, leaves changing, the holidays upon us and of course, pumpkin EVERYTHING. I unfortunately don't get to experience all the perks of the season. Living in the Virgin Islands fall means, it gets even hotter, I have MAJOR FOMO of pumpkin patches and cozy sweaters and my pumpkin spiced lattes are homemade and iced (no Starbucks for me). As soon as September hits, I have to get creative to make our home feel like fall. Obviously my regular coffee becomes pumpkin flavored and I defuse all the fall oil blends. But the biggest way to incorporate the season is in the kitchen. I'm starting with treats for the girls! The first recipe I've been making for my daughter, Denver for breakfast for almost two years, and have been meaning to share. They are mini pancake muffins- great for an easy snack and a quick breakfasts. I used my normal recipe but added a fall twist. Baby food (this is where I sneak in fruits and veggies! I usually use the leftover baby food packets my girls don't finish) For this recipe to add a fall twist, I used sweet potato and squash. Cinnamon (add nutmeg and pumpkin spice for fall flavors). Preheat the oven to 350 and mix together the above ingredients. Spray your muffin tins with Pam and scoop the batter into the tins! I use a melon baller for an even scoop. Bake for 10-15 or until they are done in the middle. I honestly never time these I just use my nose and a toothpick! And that's it! I put them all into a ziplock and they last us about a week! So great to pair with fresh fruit in the morning, or make it extra special with a little powdered sugar and maple syrup! The best thing to pair with these muffins would obviously be pumpkin spice milk, right!? Inspiration by The Ever Co t shirt I thought I'd whip up some pumpkin spice milk for the girls, while I have my latte. It super easy, bring your choice of milk to a boil in a saucepan. Add nutmeg, cinnamon and pumpkin pie spice. Stir in 1-2 tablespoons of pumpkin purée. Constantly stir to dissolve the purée. Once it has a light orange color let cool and refrigerate. Serve cold! I added some fun paper straws with a little ribbon to make hem extra festive! You can also start with heavy cream, so the same processes and you have creamer for your coffee! My favorite thing to make in the fall is chili! It makes the whole house smell amazing and SO yummy! Of course, it has to be a rainy day for me to pull off or it's too hot! I really like this recipe because I like to use what I have on hand, substitute for what you got! Veggies of choice. We prefer warm colored peppers, fresh corn, green beans, carrots. This can be as easy as you make it- frozen or canned veggie work just fine. If you have the fresh produce (and the time) go for it. Beans* optional- we don't prefer them. Rice or corn bread, which ever you prefer to serve your chili over. Another perk of this chili is you can start cooking it as early as you'd like! I really love putting in on the stove at nap time that way when everyone gets their second wind at 5pm I'm not stuck in a hot kitchen. Coat the big pot in EVOO and put over medium/ high heat. Add the meat and cook. Add 1/2 the chili packet, olive oil and water to prevent the meat from getting dry. When the meat is almost cooked through add any veggies that need cooked. This is where I add any fresh produce to get a nice brown on them. Then dump in the rest. The jar of sauce, the rest of chili packet, canned veggies, spices to taste, etc. Cook rice as directed in a small sauce pan before serving. Shred cheddar cheese then finish with sour cream and serve! Really the best part of fall is the weather gets cooler so you can snuggle your family and little tighter! Cheers and happy fall y'all! 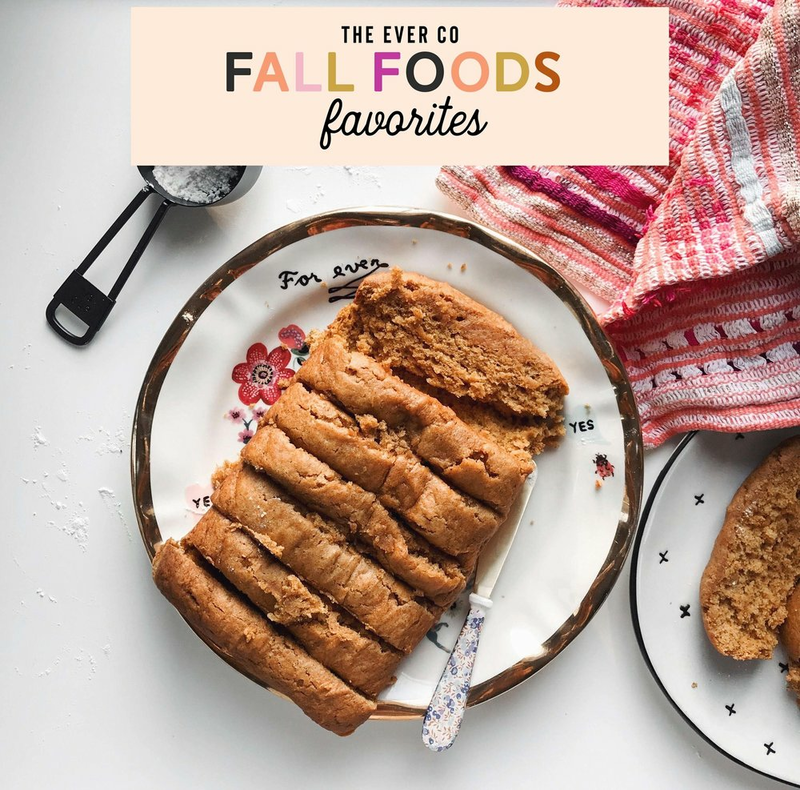 pro tip : If you loved any of these recipes, be sure to pin the image above so you can always reference this blog post for fall food favorites in the future! It’ll stay right on your pinterest board for easy reference! Thank you so MUCH Kelsey for these yummy recipes and to all the others for sharing your gorgeous pictures with us online! You’re truly all so inspirational! Of all the holidays / seasons - I am most inspired by the colors of this time of year. And these books SCREAM fall colors! Gimme all the orange, pinks and blacks! A playful, delightfully illustrated book that sets the record straight about ghosts. Ghosts are not sheets with holes dragging around a ball and chain. Indeed, they're just as colorful and diverse as humans. Here you'll meet the ghost of the chimney, the TV, the kitchen, and the library, to mention just a few. From two cats waltzing to twenty cats in a conga line, dancing felines take to the streets, the fire escapes, and the rooftops in this charming concept picture book that is part counting and part introduction to music, dance, and rhythm. The short rhyming text makes it a perfect read-aloud treat, and with vivid illustrations from a breakout DreamWorks animator, readers and listeners alike will be thrilled to see what happens one night on Easy Street when a pair of cats start to groove to the beat. In this lovely book, young readers are introduced to a variety of beautiful birds, from the familiar chicken to the exotic ibis. But lurking in the background of every page is a cat, who also seems very interested in the birds. With its funny illustrations and engaging concepts, this clever counting book will invite readers to linger over every page. Oh, to be a ballerina! It's a challenge for any little girl, but even more so if you happen to be a vampire like Vampirina. First of all, you have to find a class that meets at night. Then you have to figure out how to perfect your form when you can't see yourself in the mirror? And then there's wearing pink (not the most flattering of colors if you happen to be undead) and that nagging urge to take a little nip out of the other dancers. And worse of all? STAGE FRIGHT!!! One cool day in late October, Georgia noticed something weird. Objects would move around the house and sometimes they even disappeared. Now, some people may have wondered (especially at this time of year) if this was the work of something spooky? But not clever Georgia! She has all the explanations and none of the fear! Join her in debunking the spookiest of ghoulish and ghostly mischief in this Halloween adventure! Where the Wild Things Are is fifty years old! Maurice Sendak's Caldecott Medal-winning picture book has become one of the most highly acclaimed and best-loved children's books of all time. A must for every child's bookshelf. Introduce a new generation to Max's imaginative journey with this special anniversary edition. Let the wild rumpus continue as this classic comes to life like never before with new reproductions of Maurice Sendak's artwork. Spartacus goes to ghost school like all the other ghosts, but he's a special ghost: he doesn't like to screech in a scary way, he doesn't want to haunt and was always polite. What will happen to Spartacus when he's sent by the Head of school to the Abandoned Tower? A warm picture book by bestselling author-illustrator Guido van Genechten about a friendly and special ghost. I hope you can find joy in the little moments today. Like throwing all the comfy pillows on the ground, curling up with those babies, and reading a story of magic and hope. Hold those babies closer for me. They keep our passion alive here at The Ever Co. It's finally here! 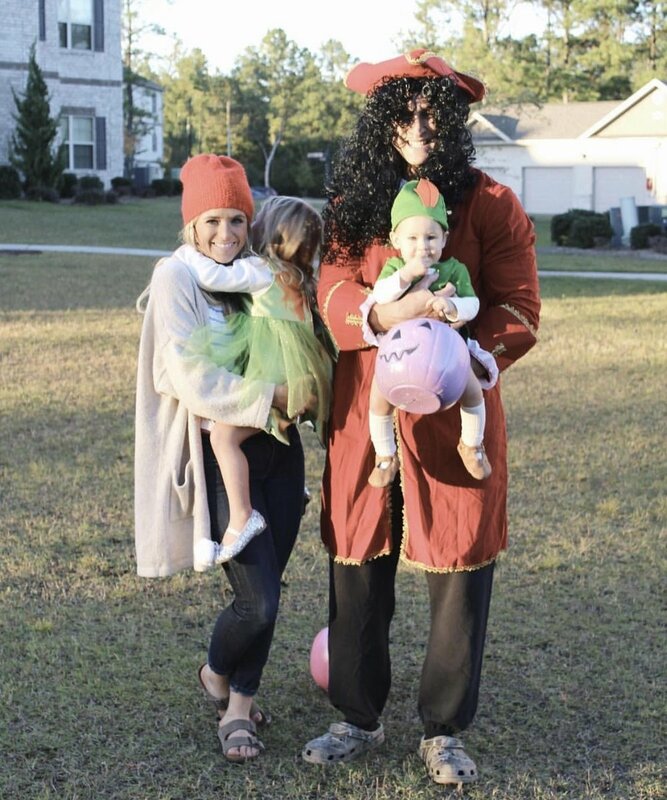 My favorite blog post of the year : Fall (Halloween) Bucket List! We go into full Fall mode on September 1st here to squeeze every bit out of this magical time of year that we can! From pumpkin painting to roasting pumpkin seeds to decorating your front porch with fresh pumpkins and mums, here you'll find a mixture of everything to help you celebrate every day like it's a holiday. So grab a cup of PSL (pumpkin spice latte), a hot cup of tea or some warm apple cider, cozy up with your favorite flannel throw, light a fall scented candle and join me as we look into a season full of bucket list adventures! You can download the bucket list here to print it out at home (or blow it up at an office store)! Then you can laminate it and mark items off the list as you make memories this fall. Remember always, that as much as we want you to make memories and celebrate life with those you love most, never accept quantity over quality. Make the memories you make count. Chase after the quality of each adventure versus the quantity of adventures you create. So if you finish all 50 of these or just 2, make them count. It's taken me all summer to blog this. So it's only fitting that with 8 days left on The Ever Co's summer calendar I am finally blogging our all time favorite kid's summer books! My mother in law was a kindergarten teacher and has graciously handed down so many children's books to our family. They are one of my most treasured possessions for my girls because she and her late mother hand wrapped nearly every single one for the classroom. Inside so many I find little notes and dates and signatures of "Robyn." But ironically, I have always been an avid children's book collector for many many years. She knows this and was so honored to pass them down to us. We love you Nona!!! I've just always been so drawn to the whimsical illustrations and simple, yet powerful messages that children's books have to offer. The stories of magic, promise, hope, joy, strength, resiliency and community. I love that they're typically all reasonably priced and the easiest gift for other children! If I gift a book, I always write a little note in the cover, because you never know what that special handwritten note could mean to somebody someday. One day, I actually plan on writing a little note to my girls in every single book they own. Maybe on a night that we read the book I'll write something funny they did. Or something that the book reminds me about their childhood. Nevertheless, handwritten notes are a lost art. Never stop writing them. Fun fact: I hope to write and illustrate children's books myself one day! But until that day comes, here I am hoarding all the books for every magical season every year brings! I love to display the current season or holiday books front and center on these custom built in bookshelves the hubby built in our girls' shared bedroom! They're so good right?!? We're so lucky to have our handyman. Every day is full of endless possibilities - especially TODAY! The simplest moment has the potential to become extraordinary in this beautiful book by Julie Morstad. From getting dressed, to having breakfast, to choosing ways to go, Today has a little something to delight everyone. 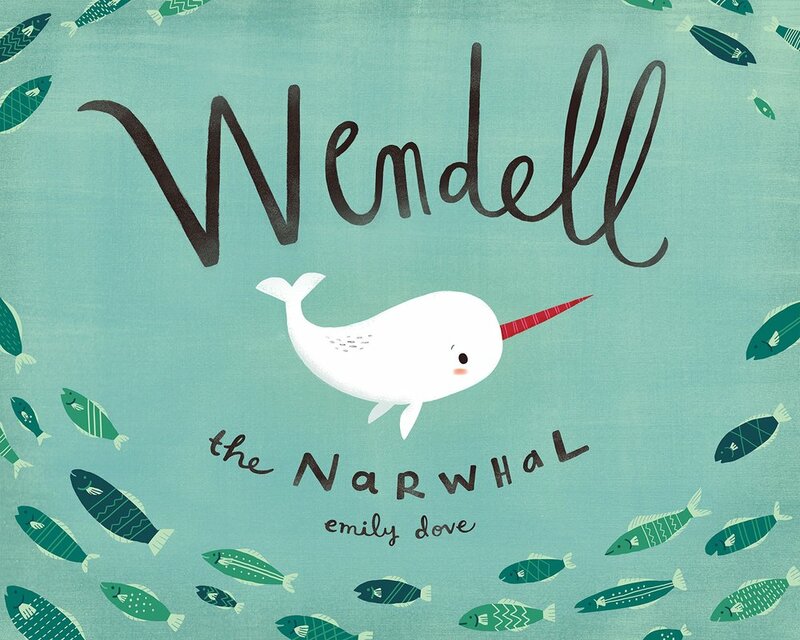 Everyone in the ocean can make music, except for Wendell the Narwhal. His big, pointy horn can't go "pop" or "clappy clap clap" or even "whoosh". Will Wendell find a way to join in with symphony of sea creatures? It’s time to learn about the sea’s most feared (and most misunderstood) residents: sharks! Owen Davey returns to nonfiction to explain the mysteries of those denizens of the deep. Some deadly, some not-so-deadly, and almost all just generally misunderstood. Exciting and detailed illustrations fill the page and educate young readers about these thrilling residents of the sea! Delivering information with the same whimsical text and brash illustration that saw his previous book win the affection of the Wall Street Journal, Smart About Sharks is sure to have teeth! There was once a little gardener and his garden meant everything to him. He worked hard, very hard, but he was just too little (or at least he felt he was). In this gentle, beautiful tale, Emily Hughes, the celebrated author of Wild, departs from the larger than life Wild-girl of her debut to pursue a littler than life Gardener, in a story that teaches us just how important it is to persist and try, no matter what the odds. With delicately woven tapestries of illustrated magic, Hughes once again transports us to a world not unlike our own, while still brimming with fantasy and wonder. Wilfred is a boy with rules. He lives a very orderly life. It's fortunate, then, that he has a pet who abides by rules, such as not making noise while Wilfred educates him on his record collection. There is, however, one rule that Wilfred's pet has difficulty following: Going whichever way Wilfred wants to go. Perhaps this is because Wilfred's pet doesn't quite realize that he belongs to anyone. A moose can be obstinate in such ways. Fortunately, the two manage to work out a compromise. Let's just say it involves apples. In this beautiful picture book by Hawaiian artist Emily Hughes, we meet a little girl who has known nothing but nature from birth—she was taught to talk by birds, to eat by bears, and to play by foxes. She is unashamedly, irrefutably, irrepressibly wild. That is, until she is snared by some very strange animals that look oddly like her, but they don't talk right, eat right, or play correctly. She's puzzled by their behavior and their insistence on living in these strange concrete structures: there's no green here, no animals, no trees, no rivers. Now she lives in the comfort of civilization. But will civilization get comfortable with her? This first book of nature helps young readers to discover the world of wildlife on their doorstep. Beginning in spring, this book revisits nine different places, including the farm, the back yard, and the woods, during each of the four seasons through the year and explores the changing scenery and animal life found there. Informative and fun text teamed with gorgeous, decorative illustrations make this the perfect book to celebrate each season with. The week The Ever Co went from being a full time hobby to a full time job. and also the week I had to personally make the decision to sink or swim. Thursday, August 16, 2018: We were prepared to launch a new line like every other limited edition line we'd launched for the previous 8 months since our little shop came to be. Except this time, I could tell something was different. The feedback I was getting from our community at The Ever Co was CRAZY. I was gaining an abnormally high number of followers by the minute, and I could tell this was going to be a very successful Back to School / early fall launch. But what I didn't know was how successful it would be. We launched four designs and in total, 520 shirts were purchased in a combined total of 8 minutes. The shirt that changed our business. You would probably think that we were poppin' bottles of champagne and celebrating huh? You hear all the stories of shops having their "moment". Their claim to fame per say. And quite honestly, our tees went on a mini viral spree. The instagram algorithm which has worked against small business owners for soooo long was actually working for me and spreading our tees like wildfire. Honestly? Who knows how many shirts would've actually sold had the stocked inventory been "unlimited." We'll never know. But my celebration never happened. and honestly, it was quite the opposite. From the moment we sold out of 520 shirts at 10:02 pm on Sunday August 19th, 2018, to the moment my tired wet eyes finally fell asleep the next morning at 2:00 a.m., I sat in my office and cried. Not quite the success story I imagined. But I wanna share why this hit me so hard, and try to explain a little about the business model we are aiming for here at The Ever Co.
My hope is that in sharing these words you will understand why we have limited quantities, why we more than likely will always have limited quantities and why my heart was so crushed to sell out so fast. You've watched this business go from dream on a paper napkin to full blown reality, and it's an honor to share this story with you. On June 4th, 2018 I officially became a "stay at home mom." Up until then, The Ever Co was truly just a hobby. I put in minimal time to the business, but in June I knew I needed to start pouring my heart and soul back into a community I was so eager and passionate to Found last December. What I didn't realize was that our little Everly was going to be diagnosed with Austim this year and that there would be so many other huge life changes for our family that would be continuous competing requirements with my desire to jump in head first to this business. It's all taken so much energy from me - more than I realized I had. And every single morning I open my eyes, thank the Lord for another day here on this Earth, place my feet on the ground and pray for energy and grace to get through another day living selflessly for so many people I love. So I've continued to just give as much as I could to this business while not jeopardizing time with my family. That's a choice I've made and will always make. The hubby and those two little girls will always always come first. I've heard too many stories of entrepreneurs losing their relationships because they poured too much of themselves into their businesses. Cause their hustle couldn't stop hustling. And I never want that to be the case for me. I think that's why I dream of doing something that the family can be involved in. One day, our little pumpkin patch or Christmas Tree farm dreams will come true. And this is what EVERY SINGLE small business owner has to decide when the moment comes. When is it time to outsource some of these duties? When is it time to ask for help? When is it time to allow yourself to grow while being able to stay true to who you are and what your brand was intended to be. So many decisions came pouring in this weekend. And while Blake was sleeping cause he had to be up early for work the next morning, I sat in my office and cried big ole alligator tears that poured straight onto the keyboard I'm typing this on right now. How did we get here so fast? What am I supposed to do? Quite honestly, this weekend was the first time since I started putting pen to paper a year ago to make this business happen that I wholeheartedly believed in myself. Believed that this could really be it! This could be my "job" for the rest of my life. The Ever Co could actually retire us. the first time I truly believed I could swim. But ironically, it was also the first weekend that I doubted everything I was doing. That I started questioning if I was in way too deep. If we were growing too fast and couldn't keep up. the first time I truly believed I would sink. It's crazy that your heart and mind can go to completely opposite ends of the spectrum in a moment like this. But every single possible thought of success and failure crossed through my mind and I felt like I was drowning in my own thoughts. I sat on my phone and read nearly 300 messages from people asking why we sold out. why a pre-order didn't have unlimited stock. when we were gonna restock. why their carts had items in them and then the items sold out before they could check out. and the list goes on. I then read another 100 emails echoing the same thoughts. I hopped on my phone and texted two of my closest friends and business partners Haley of Indy and Pippa Co and Blake of Jean and June. and I just said, "help." I feel defeated. For the next hour at 10:00 pm they assured me that I was okay and they gave me the boost of confidence I so desperately needed in a moment I felt all alone. They continued to remind me that I was doing everything I could and didn't know this would happen. But they both continued to say something that will resonate with me until the day The Ever Co no longer exists: You are doing ALL YOU CAN while not jeopardizing time with your babies and hubby. And they were so so right. That was all I needed to hear to start swimming out of deep waters into shallow territory. i started to swim again. I hopped back on Instagram and carefully wrote some defensive messages about why our shop is the way it is, and instantly started receiving so many messages of encouragement. It was as though everyone knew (without knowing) that I was really having a hard time. The messages of encouragement flowed in and finally by 2 a.m. I was able to close my eyes and look forward to the joy He so graciously brings anew every morning. So a night that I should've been celebrating, I felt defeated. I am a people pleaser by nature. I've been that way for my entire life. I've gotten sooooo much better at it over the years (mostly since meeting Blake and being in the Army), but I'm still a pleaser by nature. And it's not because I want to necessarily make everyone happy and make everyone love me. Quite honestly it's just cause when I care about something or someone, I care about them hard. I am so passionate about the things I love, and when they hurt, I hurt. When they worry, I worry. When they're disappointed, I'm disappointed. So I'm overly passionate about this community because I truly LOVE you all. I want to serve you, because you allow me to pursue my passion. I wrote a blog post when I first started the blog called "Redefining profit" and the main theme was that I didn't care how much money we made. My promise was to always pursue the people. So when all of the messages started pouring in of disappointment for selling out too fast, I felt like I let an entire community down. I felt so painfully defeated. The anxiety that I deal with daily started pouring in the floodgates and I was sinking. fast. I started questioning how I could've done everything better instead of being down right grateful for 520 orders. And I woke up this morning feeling revived. Blake and I had a "business meeting" hahah! for about two hours and I placed another huge order of shirts to get us through fall. I don't think we're gonna change much about our business model. For now. I know that for this season that we're in - it's what's right for our family. I can't risk it for them. Our shop was founded to inspire you to celebrate holidays and create family traditions with those you love most. Our tees were created to inspire you to ACT. To get out and make memories with your loved ones. Because each of our tees has a distinct purpose and correlates with a specific event or holiday, we release them in limited quantities because they are unique to a certain time of the year. We did this to limit the amount of dead stock we would maintain. Our goal was to sell through 75% of our inventory every month so we wouldn't have to maintain a lot of stock on our shelves as we move to the next holiday. In doing this, it allows us to continuously bring you new trendy and hip designs for every season and occasion! So if you don't snag one one launch, you can hopefully get one at another. Being that we are a Military family, this is CRITICAL for us. We cannot maintain a lot of stock because we are constantly moving. It's just not smart for us. Additionally, we are a live debt free kinda family. Both in and out of the business. We pay for everything on our credit cards and ensure we are able to pay it off every month to build up our credit while maintaining no debt. Every month, we then put 40-50% of our paycheck into savings or investments. We've implemented these same principles into our business and are doing everything we can to remain debt free. In doing this, we are only using the money made from previous launches to reinvest into the company to fund future launches + more! So the better our sales do, the more we can bring you in the future. Because our shirts are made custom for our shop from scratch right here in the USA, our turnaround time is very long. From the moment I pay for an order, it takes 4-6 weeks to have the fabric cut, sewn, dyed, screen printed and sent back to me to send to you! I am extremely involved in the process and keep an eye on the timeline throughout it all to try and get the shirts as quickly as possible, but I also know that it's because we are getting the BEST quality organic cotton shirts and so every minute and day that we wait is worth it because of the quality. However, with this timeline, that also means we have to "front" the costs of all tees. Even if we do a pre-order, we are paying for the tees up front because of the timeline. This is specifically why our pre-orders also have "limited stock". We will continue working to announce and release pre-orders sooner so that customers are actually able to front the costs for their own tees, but that will all be a work in progress. The end goal will be to have unlimited pre-order stocks. So... for now we will continue releasing limited quantities at each launch and based on the response and time available we will do a "pre-order" sale shortly following the launch. We just started all of this 8 months ago. We just ask for so much grace upon grace as we continue learning to swim over and navigate these new waters. And if you can put your trust in me, I promise we will continue to learn and be the best Ever Co tribe leaders we can possibly be. I pray that this blog post (which was probably way too long and way more than you wanted to know-story of my life) brings some light to our shop and how it came to be. I hope that it will answer questions in the future if we run into this again. And lastly, If you're a small business owner and are reading this, are you sinking or swimming? I pray with every ounce of my being that this post gives you a little boost of encouragement to reevaluate your passion and your purpose. Don't over hustle the hustle. Keep reminding yourself why you started and who you serve. there you will find shallow waters. The week of the Fourth is such a sweet holiday for our family, because we always know Blake and I will have time off from any military obligations and can truly spend quality time together. It's been so nice to have daddy home and to enjoy celebrating America! Here's a look into our week and all of the fun family traditions we have. We have LOVED following along with all of your traditions on Instagram and seeing you make memories with your loved ones! We started the week with a little dance party (to Party In the USA) to kick off our long week of fun! On the night of the Fourth, we had our annual (tiny) front yard fireworks! We started doing this three years ago when Everly was just a baby and have loved having mini fireworks just for our little family! We also enjoyed some more fresh farm picked watermelon and drew the cutest fireworks chalk art! You can see more of my chalkart under the #hawthornegirlschalkart hashtag on Instagram! Funny story about this pic...I am the most horrible watermelon cutter ever. If I concentrate REALLY hard, I can make it look decent...but I can fly a helicopter; just don't ask me to cut your watermelon. Ha! So, this time I just cut big pieces off and we ate out of it with spoons. And let me tell ya, it was just as delicious + juicy! With all the time off work, hubs and I took the girls out back and we had a blast playing ALL DAY in our little blow up pool! I grew up playing softball, and Blake's just a great athlete, so we spent a few hours throwing the ball in the backyard while the girls played monkey in the middle! Then came the fun part! Every year, for the past three years, our incredible neighborhood has thrown a huge Fourth of July celebration. We have a huge Easter egg hunt and Friendsgiving (for Thanksgiving) as well. We live in a neighborhood pretty far out in the country, so it's a very small secluded one, surrounded by trees and the simple sweet sounds of nature! But it allows all of us to be more like family. We help each other out during deployments, take care of each other's dogs and kids, do house projects together, and the list goes on. I know because of this neighborhood I will never ever settle for a neighborhood we don't love again. This neighborhood means so much to us. Not only have we made the most incredible memories here with the best of friends, but we've also raised the girls here. It's the first house Blake and I have remodeled and truly poured our hearts into. We will be moving around December of this year, and our hearts are already trying to prepare for so much change and sadness that comes with moving every few years with the Army. We're just ever so hopeful that we'll find another neighborhood, just like this, where we too can start a new tradition of annual Fourth of July parties. We're so excited to continue this tradition somewhere else! For the party the house with the biggest acreage rents a huge bounce house/water slide and all the neighbors pitch in money. They also are the ones that buy all of the huge fireworks and we all pitch in money for that too. Their backyard is huge so all the dads tag team to put on the BEST fireworks show ever! It's truly incredible what a few thousand dollars and a bunch of great neighbors can throw together. Everyone brings food so it's potluck style and we all wear glow in the dark necklaces and it's basically a big Fourth of July kid friendly rave! It's truly the best time ever. We're gonna miss it oh so much. Here's a look into our very own backyard fireworks show! I also made these super yummy stuffed sweet peppers which is our favorite appetizer to make for Cinco de Mayo and Fourth of July festivities! Cut peppers in half and clean. Cook sausage until brown and add in cream cheese. Stuff all peppers with mix. *You can sprinkle breadcrumbs or shredded cheese on top if you want. We ended the week with baking some good ole Fourth of July cookies to give to our brand new neighbors! You can find my favorite recipe here! Thank you for following our holiday celebrations and we sure do hope they inspire you to create traditions and make memories with those you love! Every year we go to the strawberry patch around Memorial Day weekend. Blake and I started going many years ago, but now it's the SWEETEST tradition to do with our little family tribe! Strawberry patches never disappoint for littles, and they yet again had a BLAST! One of my favorite pics. Loved walking down these strawberry rows with my girls. How are these our girls? So grateful. We'd always rather be outdoors. We found a yummy watermelon too! We hope you make lots of memories with those you love most. Memories that are sure to last forEVER. Being a Kentucky girl, we ALWAYS celebrate Derby day! But when it falls on Cinco De Mayo, it is a super duper extra special treat for us here at The Ever Co! Blake, our Ever Co papa bear, LOVES LOVES LOVES him some Mexican food, and for Derby I always make an antipasto platter with Kentucky bourbon sliders! So today, we're having our traditional Derby food for lunch and our taco bar for dinner! This morning we started the day with a milk bath for the girls and let them both take their horses in! They loved it so much cause typically their horses stay downstairs in the toy bin. They're both not old enough yet to understand the Kentucky Derby, but they do both love horses! We then turned on our ALL TIME FAVORITE show, SPIRIT: Riding Free on Netflix! Everly is absolutely obsessed with the show and Hadley just ADORES dancing to the intro song! After some screen time, we always try to go outside to play before naps. We let the girls take their horses outside (something we also typically don't let them do) and it was precious watching them play with the horses after watching the show. During nap time, Blake and I watched Seabiscuit, one of our favorite movies! Tonight we plan on watching Warhorse to end the night after the girls go down to bed. A couple hours before bed we FINALLY got to watch the main event! The Derby!!! It is always so much fun watching the horses every year, and I can't wait to take the whole family to the Derby in real life one day! After the Derby, we finished the night with the girls watching CoCo and eating our dinner which you can read about below! Our dinner was all about Cinco de Mayo. We just love making these traditions with our family. Here's what I always get for my cheese boards! Here's the ingredients + instructions for the sliders! Here's what I always get for our taco bar! We sure do hope you've had just as much fun with your family celebrating both Cinco de Mayo and the Kentucky Derby! Next year, if you don't already, maybe you can incorporate some of these traditions with your family! We're big believers in celebrating everyday like it's a holiday and creating traditions that'll last forEVER!